Natural Gas Operated Pumps are CSA* (Canadian Standards Association) certified to ANSI LC6 standard for operation using sweet or sour natural gas. The pumps are also compliant with NACE Standard MR0175/ISO15156. The gas pump utilizes Aluminum or 316 Stainless Steel wetted construction with Nitrile or FKM diaphragms and check valves. The gas valve is constructed of Aluminum with Nitrile or FKM (fluorocarbon) elastomers. Pumps are fully groundable, preventing static discharge. The G10F and G20F Heavy Duty Flap Valve Pumps are the newest addition to SANDPIPER’s line of CSA Certified G-Series Dual Power Pumps. The flap check valve design allows passage of larger solids than traditional ball valve pumps and is ideal for abrasive slurries, suspended and non-suspended solids and line-size solids requirements. The exclusive bottom discharge porting arrangement provides superior suction lift and eliminates the damage from settling solids in your pump. 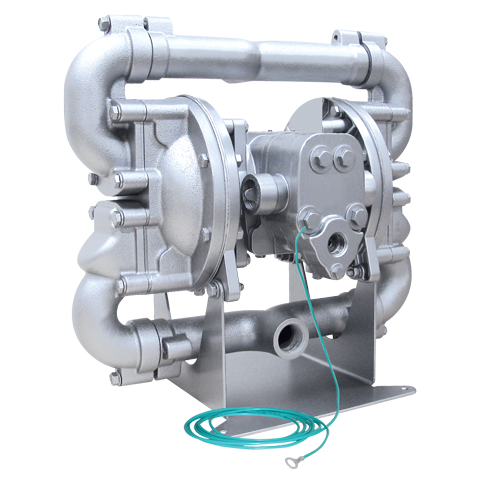 These Heavy Duty pumps features thick wall construction and are enhanced with an extended wear package. Click here for G10F Metallic Pump Data Sheet.